United European Car Carriers (UECC) says its plans for two new generation pure car truck carriers (PCTC) that use a hybrid of battery of LNG power will allow them to go beyond IMO's target for a 40% reduction in carbon intensity by 2030. "This is a giant leap towards decarbonization, and unlike anything else that has been done previously in our industry, I believe, and something that we are extremely proud of," says UECC's CEO, Glenn Edvardsen. A contract to construct the 169 metre long vessels has been signed with China Ship Builidng Trading Co., Ltd and Jiangnan Shipyard Group Co. Ltd and includes options for two additional vessels. The first vessel is planned for delivery in 2021. While there is still considerable debate as to what the well-to-wake CO2 savings of LNG bunkers actually are, UECC's Head of Ship Management, Jan Thore Foss, says by its calculations the LNG part of its solution will reduce CO2 emissions by about 25%. UECC says it also plans to use carbon neutral and synthetic fuels as part of its future fuel mix. 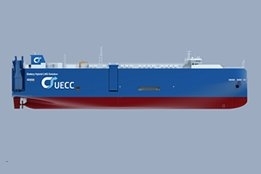 United European Car Carriers (UECC) is jointly owned by Nippon Yusen Kabushiki Kaisha (NYK) and Wallenius Lines.